Recently, Team DSC® had the opportunity to interview the Principals of PHX Architecture – Erik Peterson, Scott Carson, Ron Skoog, and Nikal Conti. In our conversation, they each revealed their unique perspectives on the meaning behind PHX Architecture’s tagline “Living Architecture,” and how they utilize this philosophy to breathe life into their many custom residential and commercial projects as well as the greater community. Today, we wish Nikal Conti much success as she ventures from PHX Architecture to endeavor new architectural, engineering, and design projects. We also congratulate Ron Skoog, AIA, LEEP-AP as he recently became the newest PHX Architecture Principal whose focus will be to further the firm’s commercial, hospitality, restaurant, clubhouse, and sustainability markets. 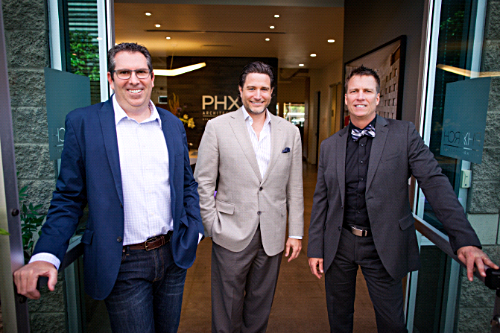 With Ron at their side, Principals Erik Peterson and Scott Carson look forward to advancing the talented team at PHX Architecture into a very bright future. Together they will continue to embrace leading-edge technology, cultivate the next generation of architects during their high school summer camp, and inspire new residential and commercial designs both in Arizona and throughout the country.